It's no secret that coral reefs throughout the world are suffering due to a variety of stressors. Coral bleaching, a process by which a corals symbiotic algae known as zooxanthellae is expelled from the corals tissue, leaving it stark white is the primary cause of mass coral mortality. While multiple factors can lead to coral bleaching, the number one stressor is the increase in sea temperatures, which creates an environment too warm for coral to survive in. In early March, scientists in Australia reported a consecutive mass bleaching event on the Great Barrier Reef following a 2016 bleaching event, which killed off large sections of the northern regions of the reef. In the Florida Keys, coral reefs have showed a steady decline over the past few decades, with certain species such as Acropora palmata (Elkhorn Coral) exhibiting a 90% population loss. Top Left: Healthy Elkhorn Coral at Looe Key Marine Sanctuary Top Right: Completely dead Elkhorn Coral at Looe Key Marine Sanctuary Bottom: Coral recruits (baby coral) of Elkhorn spawn collected from the wild and fertilized in lab. Left recruit shows colonization of symbiotic algae, while the recruit on the right still shows its initial clear tissue phase. The Mote Marine Laboratory is developing and fine tuning methods to restore coral reefs in the Southern Florida Keys. Part of what makes Mote's works so unique is the variety of species they're working with. Throughout most of the Caribbean, the majority of coral restoration has been practiced with Acropora cervicornis (Staghorn Coral) as this is a relatively fast growing species. 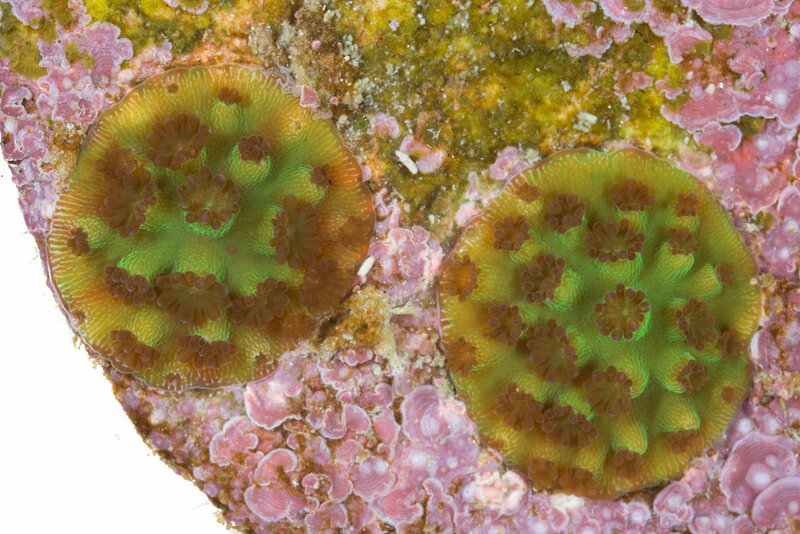 Coral restoration with large bouldering corals was presumed nearly impossible due to their incredibly slow growth rates, but through new and refined techniques of microfragmenting corals, Mote is making it a reality. 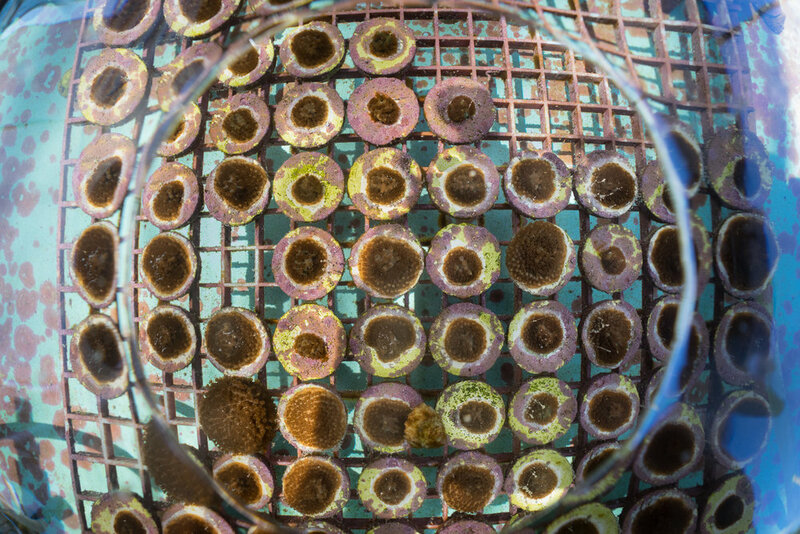 Director of Mote's coral reef restoration project, Dr. David Vaughan, is spearheading this project, with coral biologist Christopher Paige overseeing the day to day operations of growing and out-planting the corals. 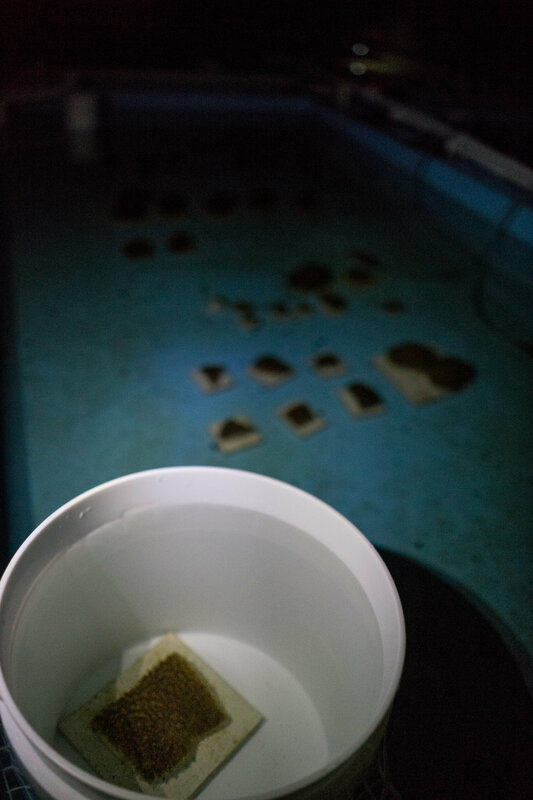 The process of microfragmenting corals is accomplished by taking a piece of coral grown at the lab and using a wet band saw to cut the coral into 1cm x 1cm pieces. The cut fragments are then glued onto a plug, and within 4-6 months, this small fragment will have filled out the entire plug and then some. 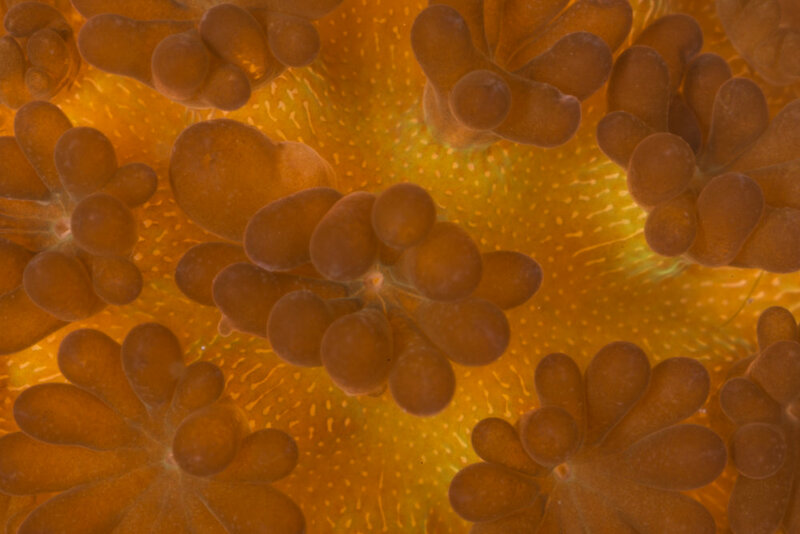 With respect to some of the bouldering coral species Mote is working with, this growth rate is many times faster than what they would accomplish in the wild. While it's not entirely understood why the cutting process leads to a temporary explosion of growth, it is thought to be a wound healing response, where the coral fragment is putting more of its energy than normal into creating new tissue. This process of microfragmenting corals has the potential for exponential growth when thinking about the sheer numbers of fragments it's possible to create. One limitation to the micro fragmenting technique is that you don't gain the advantage of adding new genetically distinct individuals to the reef that sexual reproduction provides. For this reason, spawning season is a crucial part of coral restoration. For Caribbean species such as Dendrogyra cylindrus (Pillar Coral), researchers have been able to pinpoint the moment they will spawn to the hour in some cases. After the 2nd full moon in August and a few hours after sunset, divers will wait by wild colonies with giant nets to gather the gametes when the coral begin to spawn. Spawning may occur over multiple consecutive nights. Simultaneously, back at Mote, interns and staff are watching the D. cylindrus fragments closely to see if spawning at the lab will occur. While the fragments at the Mote did spawn, successful fertilization came from the wild colonies gametes. Other species such as Acropora cervicornis (Staghorn Coral), Acropora palmata (Elkhorn Coral), and Orbicella faveolata (Mountainous Star Coral) were also successfully fertilized in lab from gametes collected from wild colonies. D. cylindrus is considered reproductively extinct on the Florida Reef Tract, as no successful recruitment has been documented in over 30 years. Colonies are too few and far apart, that the chances of gametes from a male and female colony meeting up and fertilizing in the water column is near impossible. Mote currently has ten surviving single polyp recruits from the August 2016 spawning event. This is the first time anyone has gotten a D. cylindrus recruit to survive for this long. Currently, Mote is creating a gene bank of various D. cylindrus in the case that the remaining surviving colonies die off. Left and center images show D. cylinders recruits at 3 months post fertilization. Right image is taken at 6 months post fertilization. After the rapid growth phase following microfragmenting comes planting season. 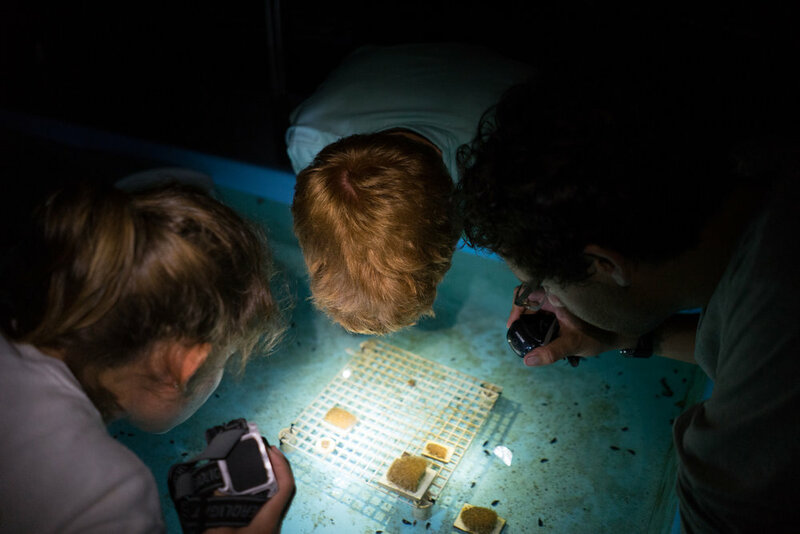 This is where all the months of intense caring for these fragile species is put to the test when individuals are cemented to dead coral skeletons to begin restoring the Southern Florida Keys coral reefs. Out planting will be covered in Part 2 of this story coming later in the year.